Now a popular skiing and hiking tourist destination in northeastern Italy, the history of the Dolomite mountains goes back 280 million years, when the area was dominated by flourishing seas that created massive layers of calcium-based deposits from sea-living creatures and their shells. 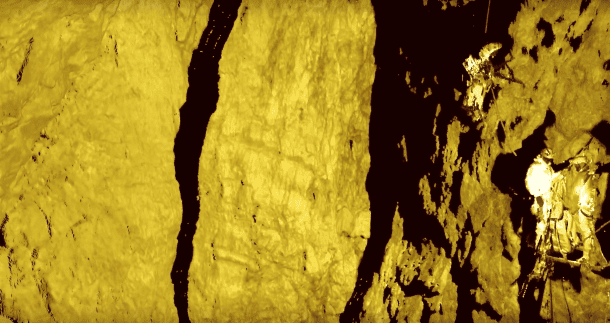 In some places, near-continuous deposits of calcium measure more than 1,000 meters thick. A mineral that composes much of the area’s most-visible rocks, double calcium carbonate, was named dolomite after its discovery in these mountains by Déodat de Dolomieu in 1792. The mountain range, a subsection of the larger Alps, was named “The Dolomites” shortly thereafter. After millions of years of mountain building followed by erosion to carve the spectacular peaks and valleys, glaciers began to dig out the Abyss of Cenote as far back as 50,000 years ago, as deposits dating back to that most-recent Ice Age can be found in the cave floor. Although it’s nearly impossible to chronicle all the specific details and variations of the erosional process, water was doing the most-recent cave building. The Dolomites’ calcium-carbonate-based rocks are particularly susceptible to water erosion, as the mineral dissolves easily. Up until 1994, the crater was filled with water up to the top and known as the Lake of the Two Forks. Then the lake suddenly and unexpectedly drained out the bottom, and the resulting cave became ripe for exploration. Soon after the lake drained, the Speleological Club Proteo of Vicenza, Italy, was the first group to explore the crater. 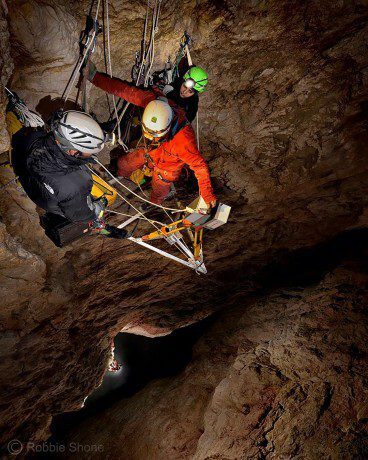 But due to the natural difficulties of exploring a cave at the top of a mountain and the extreme weather involved, it wasn’t until 2010 that a team went beyond the cave’s first 70 meters and into a large inner shaft that leads to the cave’s massive, lower room. 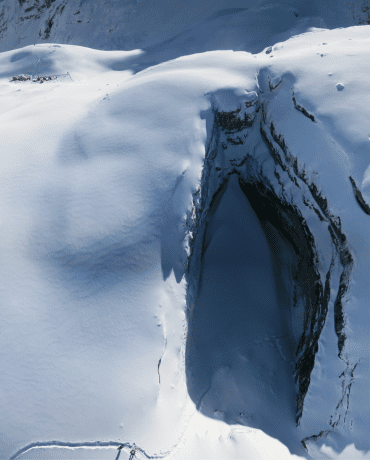 Discovery of the shaft prompted action from The Project Inside the Glaciers, which is sponsored and supported by La Venta Geographic Exploration, an international research association leading geographic exploration projects in several remote areas of the world, with a main focus on natural caves. The expedition was coordinated by geologists and association members Alessio Romeo, Francesco Sauro and Tommaso Santagata. 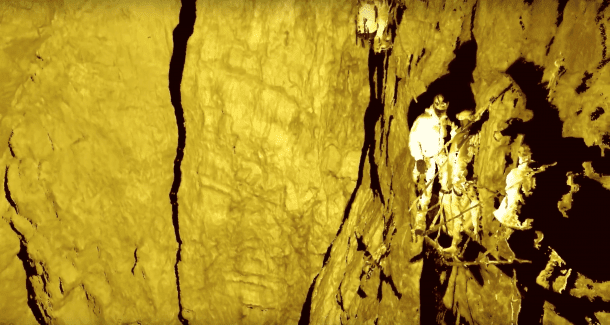 “The main goal of this scientific research expedition was to measure the final room of this cave with a terrestrial laser scanner, obtaining data that could be used to calculate volume and study the stratigraphy of the walls, which in this chamber are more than 180 meters high,” says Santagata, a 3D laser-scan technician and UAV pilot as well as geologist and speleologist at La Venta. 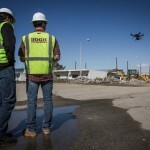 The team became so committed to the project that when costs for helicopters and other equipment ran over budget, all 18 member contributed out of their own pockets to complete the mission. 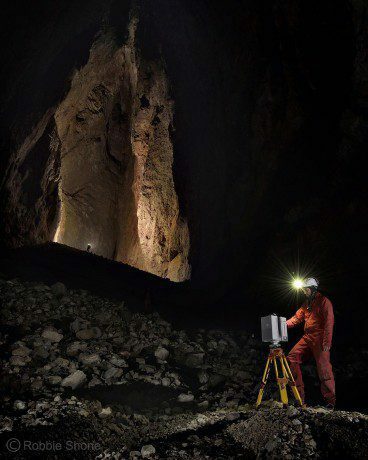 To create a full 3D digital representation of the cave’s opening and inner chambers, the team used a combination of UAS, laser-scanning and photography equipment. 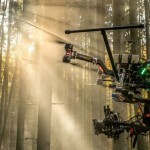 The UAS was a quad-copter mounted with a Canon camera to create a 3D model of the cave entrance. The photography was captured by Alessio Romeo as well as renowned cave photographer Robbie Shone. Inside the cave, technicians used a Leica HDS7000 phase-difference scanner to collect 12 scans at 12-millimeter resolution. All but one scan was captured from the floor of the lower, unexplored room. But to get a complete survey of the upper reach, the crew used ingenuity and construction skills, building a scanning platform on a shaft wall 115 meters above the floor. Thanks to equipment donations from Studio Laserscangst and the University of Innsbruck, the team also installed temperature and pressure sensors as well as data loggers to extract as much information as possible in the limited time available. 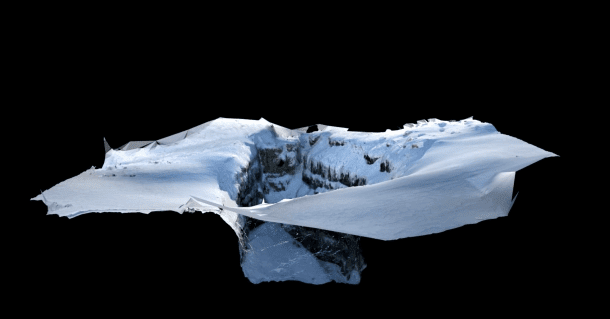 After using Leica’s Cyclone and Hexagon’s 3DReshaper modeling software to stitch together the point clouds and turn them into a 3D model, researchers were able to visualize and understand the cave’s size and complexity. 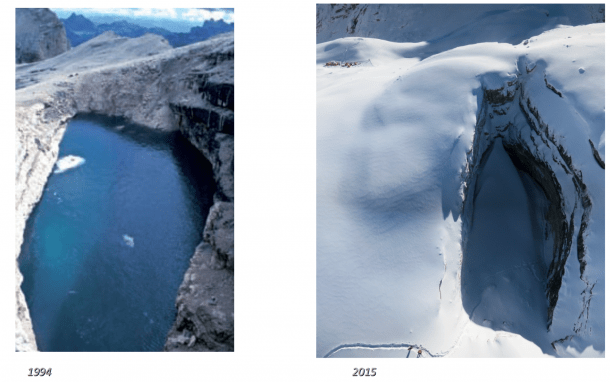 “This cavity is one of the most-important paleoclimate archives in the Dolomites,” notes Santagata. 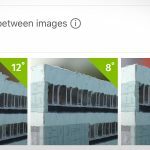 The lower room has a maximum width of 120 by 36 meters, with a base area of 2,734 square meters and a volume of more than 200,000 cubic meters. The total height of the abyss exceeds 200 meters, making it the largest underground room explored in the Dolomites. According to Santagata, such data and models will serve as a fundamental base for future comparisons. The floor of the final chamber is rich in glacial deposits, and it’s expected to evolve and change through the years due to climatic changes on the surface. The scans will serve as the basis of future studies on its evolution. 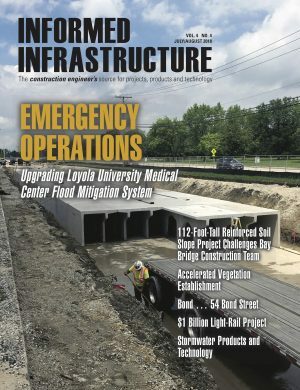 Todd Danielson is the editor of Earth Imaging Journal and managing editor of Informed Infrastructure; e-mail: tdanielson@v1-media.com.